There's a superstition that getting pooped on by a bird is good luck. But, what if human waste falls on you from the sky? It was five or 10 minutes before 4 p.m. when "all of a sudden — swoosh! We got wet," said Linda Smith. "We looked out there to see if somebody threw something at us, but there was nothing. It just came from out of the air." The deck, railing, and windows of the house were all splattered with what Smith described as black liquid. "It was like somebody's septic tank burst," said Smith, who ran inside, sick to her stomach. "It was really bad." 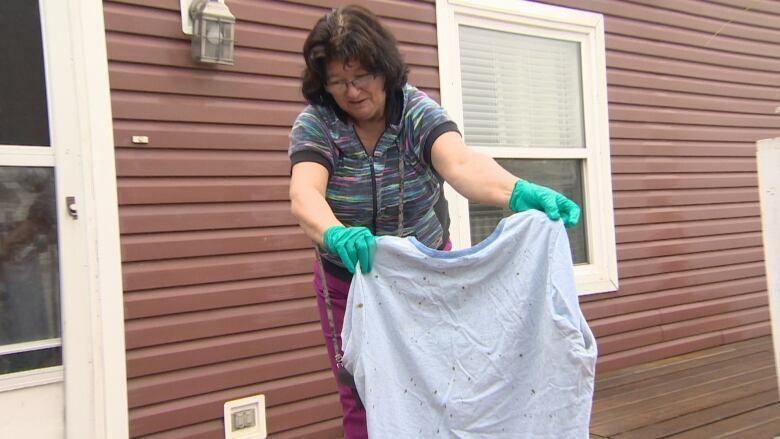 Smith and her family showered off the suspected feces and bagged the evidence — among it, a soiled tank top and a once-blue shirt, now speckled brown. Yellowknife RCMP say they are investigating. As a kid, Smith said she wondered if human waste would fall through the air if someone peed on an airplane. "We never dreamed that would ever happen," she said. However, as first reported in the Yellowknifer, she suspects that may have been the case. According to Transport Canada, it's possible. Aircraft with washrooms onboard have a sewage holding tank that is supposed to be emptied at a special airport facility, said spokesperson Pierre Manoni in an email to CBC News. Transport Canada says it wasn't feces that fell on B.C. But, if there's a problem with the valve, some of that waste can leak out. "If this happens, the liquid seeping from valves freezes and adheres to the outside of the aircraft when the aircraft is flying at high altitudes," he wrote, explaining frozen lavatory waste is referred to as "blue ice." "As the aircraft starts its [descent] and the atmosphere gets warmer, the ice will start to melt and pieces will detach themselves from the aircraft. These pieces of ice will either melt or remain in their solid state before hitting the ground." Transport Canada said dropping things from an aircraft is a safety violation. However, it has not received a report of the Yellowknife incident. Several flights were scheduled to land in Yellowknife on June 24, around the same time the suspected poop landed on the Smith family, according to the website flightradar.live. A First Air flight was scheduled to land at 4 p.m., a Northwestern Air flight at 4:30 p.m., and a Canadian North flight at 4:40 p.m., which appears to have arrived about 20 minutes early. Brian Harrold, Northwestern Air vice-president, said the company couldn't be the culprit, because its planes don't use sewage holding tanks that could leak. He said they are self-contained, with no access outside the plane. Harrold guessed a sewage leak from a valve would be more likely on a larger plane — like a Boeing 737. Both First Air and Canadian North said their planes have bathrooms, but they have not received any reports of problems. "Our aircraft are carefully inspected before every flight and again in the hangar at the end of each day," said Canadian North spokesperson Kelly Lewis. "We've operated both aircraft for the past [three] days since Sunday with no issues, so we do not believe the substance originated from either of our aircraft." Dan Valin, spokesperson with First Air, said the airline would not have had an aircraft in the air around 4 p.m. He said he also confirmed with Summit Air, which works with First Air, that it did not have any reports of lavatory issues. Ross Aimer, a retired United Airlines captain and chief executive of Aero Consulting Experts, has another theory about where the mysterious, black excrement came from: Canada geese. "Canadian geese, that we all know very well, they have a migrating pattern where the scientists know exactly when and where they migrate," he said. But, when you account for weather — winds, masses of air, the jet stream — "these birds could be literally hundreds of miles away when they poo and that could be carried onto, unfortunately, Linda's backyard," said Aimer. "Especially when she said it was black. That could be bird excrements." Transport Canada says it wasn't feces that fell onto people and cars in B.C.